Walter and Alice are expecting their first baby, but their timing is a bit off: Walter, once a successful loan officer, has been unexpectedly downsized. They’ve had to relocate to Florida so that they can live rent-free--in Alice’s deceased aunt’s condo. When Alice’s brother-in-law Mid offers Walter a job, he literally can’t refuse. But what he doesn’t know--about the nature of the job, about the depth of Mid’s shady dealings, about what he’s really supposed to be doing--far outweighs what he does know. And soon enough, things escalate so out of control that Walter is riding shotgun with Mid in a bright yellow Camaro--chased by the police. Drew Perry paints a landscape of weird and beautiful Florida and its inhabitants--all wholly original and hilarious, and utterly believable. And at the center is a portrait of a father-to-be who is paralyzed by the idea of taking responsibility for another human life when he can’t seem to manage his own. 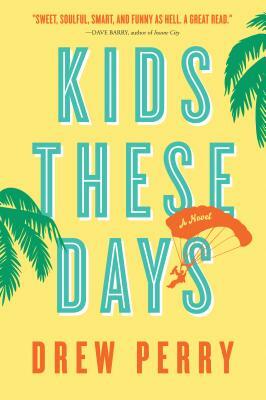 Kids These Days takes perfect aim at the two sides of impending fatherhood--abject terror and unconditional love. Drew Perry’s first book, This Is Just Exactly Like You, was a finalist for the Flaherty-Dunnan First Novel Prize, a SIBA Okra Pick, and an Atlanta Journal Constitution Best Book of 2010 pick. He has published fiction in Black Warrior Review, Atlanta Magazine, Alaska Quarterly Review, and New Stories from the South. He lives in Greensboro, North Carolina, and teaches at Elon University. Visit him online at www.drewperry.net.